A great coin vanish when dressed to the nines; the Tie Vanish is sure to stun your spectator. The magician requests assistance and has as spectator come to him. Displaying a coin, he then pulls out a handkerchief and covers the coin with it. He requests that the spectator holds onto the coin through the handkerchief to make sure that it stays put. Pulling a magic wand out of his pocket, the magician makes a pass and then returns the wand, saying the coin is gone. When the spectator protests the magician takes the handkerchief in both hands and on the count of three, has the spectator let go. The handkerchief is whipped aside to show that the coin, indeed, is gone. 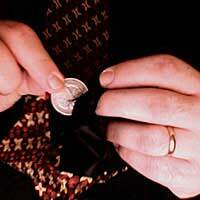 A coin of the same denomination that will be shown to the audience is placed inside the lining of the necktie so that it rests at the tip of the necktie when worn normally. A handkerchief is placed in one pocket and a “wand”- which could be a pencil or anything similar- in the other. This is a great bit of close up and tactile magic and it will really impress the volunteer holding the coin. The magician produces a coin and announces that he will be making it disappear, but to make things more difficult, he will do so while a spectator is holding it. He then asks for a volunteer. After the volunteer approaches, the magician hands the coin to him or her and asks for an examination of the coin. After taking the coin back in his left hand, the magician reaches into his right pocket to retrieve the handkerchief. “Now we cover the coin with this handkerchief,” he says, as he lifts his left hand with the coin pinched and on display between thumb and fingertips. The handkerchief will be draped over the coin, but as it is covering it the magician quickly grabs the tip of the necktie with the second coin. This second coin is the one covered by the handkerchief, with the first coin dropping quietly into a finger palm. The magician asks the spectator to hold the coin through the handkerchief while the magician gets his wand. Reaching into the left pocket with the left hand, the magician then deposits the first coin in the pocket. Now all that is left is show. A few passes of the wand later the magician declares the coin is gone. The spectator will protest, saying he can feel it. The magician replaces the wand and grabs the ends of the handkerchief. “We shall see,” he says, and instruct the spectator to drop the coin on three. On three the handkerchief is whipped away to show the coin has vanished, as the necktie falls back into place under cover of pulling away the handkerchief. Keep the spectator close to you, as the trick will be ruined if he backs up and pulls your necktie with him.